For a manufacturer that’s best known for the rugged, no-nonsense, down to earth, built to survive the apocalypse Bolero, the Alturas G4 is, well, SHOCKING! This is the most un-Mahindra Mahindra ever. And we say that out of admiration for what the product is, and out of respect, of course. It most definitely is a step (or maybe two) in the right direction. It’s a re-badged SsangYong Rexton, and everybody knows that by now. And Mahindra claims it’s virtually unchanged for India. Does that mean it has a solid chance against the Toyota Fortuner, and the Ford Endeavour? Does it feel worthy of its expected Rs 30 lakh price tag? Let’s dive deeper. Mahindra’s big boy doesn’t throw a tantrum for attention. It isn’t overstyled, and you see that the designers haven’t gone bonkers adding another line here and another crease there. We were told the Alturas G4 takes inspiration from Greece’s Parthenon temple, and that says a lot. By the virtue of its sheer size, it naturally commands respect. In the same breath, we think it doesn’t look angry or aggressive. It exudes a sense of strength. And yes, there’s a difference. Now that might swing either way with you, the buyer. You might think it’s a bit bland and could do with some more pizzazz. Especially when you view it from the rear, you might think it looks a bit too… err… generic. What we aren’t particularly fond of is the badging on the boot. Centrally placed, it does seem a bit aftermarket-ish. We’re glad the design has been carried over practically unchanged from the global-spec SsangYong Rexton, though. The obvious change, of course, is the Mahindra grille that’s dunked in some chrome for good measure. Sure, the 18-inch alloy wheels don’t suit the overall proportions of the car. But the other option was 20-inch wheels. Yes, they look finger-licking-good but would’ve been grossly impractical for our ‘beautiful’ road surfaces. Not to mention, tyre change costs would’ve shot through the roof. So, you see Mahindra is being sensible here. But being sensible doesn’t mean being boring. There’s ample bling with HID projector headlamps (high beam is disappointingly halogen), LED daytime running lamps (DRLs) as well as LED fog lamps. All these instantly grab the eye. What you might not pick on immediately though, is that the ride height on the India-spec car is slightly higher. Unladen ground clearance stands at 244mm for the India-spec version, compared to 208mm for the global-spec model. ...you really have to C-L-I-M-B inside the cabin. If the elderly folks in the family are going to use it, make sure you get side steps as an accessory. They will most definitely need it. But once you're in, it's all plush. There's soft touch material on the dash and the doorpads, the seats feel comfortable, supportive and the overall touch and feel of the various buttons and switches feel reassuringly positive. There are neat smaller touches too, like the knurled finish on the volume knob and the 4WD selector, and the wooden finish on the gear knob too. Thankfully, the cabin isn’t just about the novelty of the design and plush-feeling materials. There’s some actual room to backup the luxury experience. If you’re in the front row, you’re treated to a high-set, comfortable perch. You get an ample amount of width too, and there’s more than enough headroom, even for someone who’s taller than 6ft. But hey, if you're buying one of these, there are high chances you'll spend most of your time in the second row. Considering the size of the SUV, you would assume that it’d have acres of room in the second row. Spend some time and you sense it isn't as good as it could be simply because the engineers had to make room for the third row. There’s enough width, and you could realistically have three seated abreast. Headroom is just about enough since the sunroof mechanism eats into some valuable real estate. As far as kneeroom goes, it’s just about enough. It’s not palatial in any sense, but we don’t think you’d be complaining either. There’s a meaty armrest too, and if you want to feel extra comfortable, the bench reclines by a fair bit as well. This means you can relax and unwind here should you choose to. Prepare to get a proper headache if your kids tag along, though. Don’t get frothing yet. We’re sure your kids are absolute angels, but the procedure to get the second row tumbled can test your patience. Unlike the far cheaper Marazzo that gets a nifty one-touch tumble, you have to tug at two separate levers in the Alturas. It’s worse if you’re seated in the third row. There are two pull straps (that have mastered the art of disappearing) that need to be pulled for you to get out of the last row. And get out you’d want to. Because there's little room for adults. The third row is placed on the floor and is clearly meant for kids. For anyone over 12 years old, it will get uncomfortable very quickly. That’s primarily down to the 'knees-up' position one sits in, which can become uneasy. What will amplify the uneasiness for an adult is that the window area for the third row is tiny and further ahead. Add the black headliner in the mix, it all feels a bit too cosy. A quick look at the Alturas’ brochure will leave you impressed. Mahindra has thrown in everything including the kitchen sink at this. The equipment list brings in a few firsts, too. Not just for Mahindra, but for the segment as a whole. Sure, you get the usuals, including keyless entry, push-button start, a sunroof, dual-zone climate control, and ambient lighting. Convenience is taken care of by the usual automatic headlamps, rain-sensing wipers, auto up/down for all four power windows. Here’s where the Alturas really starts throwing punches. It gets an electrically adjustable driver’s seat with three different settings for memory. The seat will move back on its own when you unlock the car to let you get in easily. And the memory function will also remember the position of your outside mirrors. No more fidgeting around every single time you swap for the driver’s seat. Speaking of the mirrors, you can flick the toggle switch to left or right whilst in reverse to have the mirrors point downwards. Then there are bits that properly elevate the experience. Mahindra’s Alturas packs not one, not two, but four cameras. Yep, this means you get a 360° view (and you can choose a bird’s eye view too), which, along with the front and rear sensors, makes it easier to park and get out of tight spaces. Second on the list are ventilated seats that are an absolute boon in our conditions. Yes, the blowers can get a bit noisy, but they do work as intended — providing respite from the heat in a matter of minutes. Finally, there’s a crisp 7-inch display that’s sandwiched between two analogue dials in the instrument cluster. The resolution is fantastic, the response time is snap-your-finger-quick and it really does give you a host information. Be it the car’s vital stats, tyre pressures, digital speedo, the audio you’re listening to — it’s all in there, easily accessible via the buttons on the steering wheel. The same buttons will also let you fiddle around with the car’s settings for smaller things like the auto lock/unlock, follow-me-home headlamps, the tilt of the mirrors when you slot the SUV in reverse and so on. Also, I kid you not, you can change the sound of the indicators from here. Completely unnecessary, but I'm glad we have that option! Rounding things off is the electric tailgate. It also gets a proximity sensor that allows it to open the boot if you stand within a metre of the car for three seconds. Very handy if you’re lugging around groceries. Since we’re discussing the boot, you get a healthy 234 litres of space with all three rows in place. That goes up to 641 litres if you fold the third row away. There’s some more versatility here since the third row splits 50:50, and the second gets a 60:40 split. So far, so good. You see, we haven’t spoken about the Alturas’ infotainment yet. And that’s because it’s a bit of a disappointment. The India-spec car doesn’t get the bigger 9.2-inch touchscreen that the global-spec Rexton gets. There’s a smaller 8.0-inch screen instead. That said, it still gets the essentials of Android Auto and Apple CarPlay. However, the display itself is a bit of a letdown. The response could’ve been faster and the graphics could’ve been slicker too. What takes away further from the experience is the audio system that’s best described as average. In international markets, you get a high-spec 10-speaker audio system developed by Infinity Audio. But for India, there’s a 6-speaker setup. So you get four speakers in the front door and two speakers in the rear. For lack of a better term, the sound is a bit tinny and hollow. Not something that’s expected from a car that costs as much. And since we're talking about misses there are some strange omissions in terms of features. For instance, the co-driver's seat has to be adjusted manually. Even something as basic as an auto-dimming rearview mirror is missing. If you compare the Indian-spec car to the global version, you'll find more features that have been given the boot. The radar-based safety tech has been skipped completely, so you miss out on AEB (autonomous emergency braking), LDW (lane departure warning), FCW (forward collision warning) as well as HBA (high beam assist). The rear occupant will also miss out on the 220V power socket; there’s a 12V charger there instead. Thankfully, Mahindra hasn’t skipped core safety features. This means you get a total of nine airbags, including thoracic airbags placed in the second row. The usual safety tech including anti-lock brakes with brake assist, traction control, hill descent control is all in place too. Most importantly, the Alturas is made up of 81.7 per cent of high strength steel. Impressive. Impressive On The Road, Too? Before we get to that, let’s take a quick look at what’s under the bonnet. The Alturas is powered by the same 2.2-litre motor that powers the Rexton. Mahindra tells us this motor is nowhere related to the mHawk and unlike old SsangYongs. It isn’t borrowed from Mercedes-Benz either. What is borrowed from the Germans, however, is the 7-speed torque converter gearbox. As you’d expect, there’s shift-on-the-fly 4WD too, with a proper 4L mode. On paper, the numbers seem plenty - 181PS of power, 420Nm of torque. Fire the engine up, and it settles into a smooth idle very quickly. You won't feel the diesel clatter all that much. Vibrations are controlled well, and unless you’re revving the nuts off the engine you won’t feel them. However, you will most definitely hear that coarse-sounding engine. And that ’s pretty much all the time. Begin pushing it into triple-digit speeds, and it makes its discomfort amply evident. It becomes a whole lot more vocal. 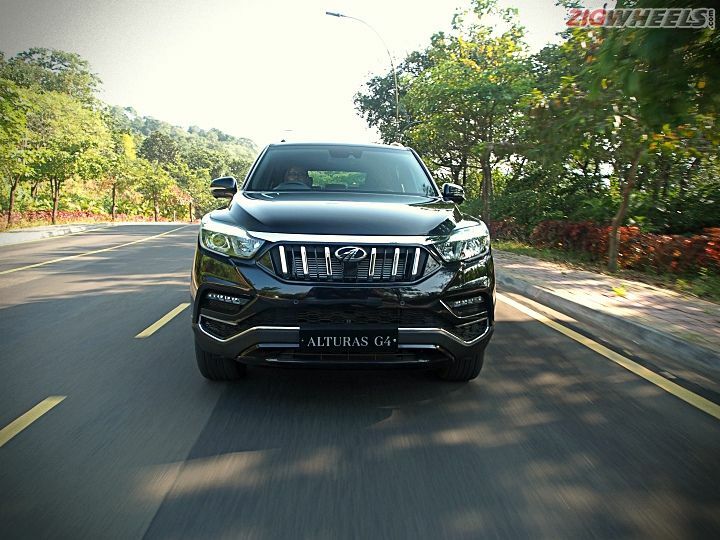 So, heads up, if you were looking at a fun-to-drive SUV, maybe the Mahindra Alturas isn't the one to pick. This engine doesn't really like being pushed all that much. Should you choose to do it anyway, the gearbox starts feeling confused. It hesitates for a second before downshifting, and there's a lag when it upshifts as well. There are no paddle shifters behind the steering wheel either. It gets those toggle switches on the gear lever (like the Mahindra XUV500), which doesn’t feel all that intuitive to use. Bottom line, take it easy with this one! When you do, the experience is a lot better. There's no dearth of power at all, and you can comfortably tackle the city without a hiccup. Yes, you do need to get used to the size while driving. But that's pretty easy to do because you can see the edge of the bonnet all the time. Inside the city, you will also appreciate the light steering and the ease it brings. At low speeds, the suspension too manages to iron out all the imperfections on the road without batting an eyelid. But there's a problem. And that problem comes to the fore when you're at triple digit speeds. The Alturas doesn't feel as planted as a car this size should. It bounces about a fair bit. Also, if you hit a pothole at high speeds, there's quite a bit of rebound from the suspension. We expect this from a big ladder-frame SUV like the Alturas, but not to this degree. Is it because the ride height has been raised? Feels like it. Not that you would, but if you choose to hustle it through the ghats, the Alturas will quickly remind you of its size. Predictably, there's body roll and if you're in rear-wheel drive mode, the rear doesn't mind stepping out or squirming a bit. While this will give you giggles if you were in a small sports car, it feels unnerving in an SUV as big as this. It definitely is a lot more planted through the corners with 4WD, though. Speaking of 4WD, we didn’t really get the chance to explore the limits of the Alturas’ off-road capabilities. We hit a few non-existent roads and a couple with nothing more than loose rocks — and it performed as we’d expect it to. That said, we will be testing it out in a proper off-road setting shortly. Stay tuned for that quick report. The Alturas, then, is a bit of a mixed bag. It scores in spades when it comes to the equipment it's offering. It feels posh on the inside and offers a proper luxury experience as well. Where it misses out on primarily is the driving department. It definitely isn't an enthusiast pleaser and would prefer it if you drove with a light foot. And on that note, we really wish the high-speed ride was more planted. So, should you buy one? If you were eyeing the Alturas as a big family road-tripper, or something that’d give you grins when you drive - the lure for the big Mahindra is limited. But, if you want nothing more than to make a statement and be pampered plenty when you’re inside the cabin, the Alturas G4 impresses.